Alfred Myline commissioned The Blue Peter and it’s still a splendid regatta yacht. Its first owner D.W. Molins went down in history as the inventor of the mechanism of rolling cigarettes. The yacht was registered at the Royal Corinthian Yacht Club of Burnham on Crouch, the most established tradition British sailing club. Completely built on Siam’s teak (hull, board and talamete) a wood cured for 70 years at the shipyard. The Blue Peter was designed to race. Having participated in a vast number of races in the north of Europe, gaining 52 first places and wining, among others, the prestigious Trophy of Scotland. Received by the trustable patron Giovanni Aprea, who has commanded the yacht for more than ten years and visited the Blue Peter looking for some traces of his past that didn’t take a long to highlight. There’s no information about the yacht before 1955, it was provably used only for cruises. It appears that year at the Register of Yachts as the number 840, being still property of Molins. This same year (1955) the yacht was bought by an engineer called Giulio Kirsh who made cruises between Sardinia and France. Shortly after its owner death, The Blue Peter had the disgrace to sink at the Marina di Carrara port’s mooring, provably due to the rupture of a tube connected to the hull’s valve. After being recovered in 1978, the yacht’s ownership happened to be of the Captain Giuseppe Longo, who used the boat as a charter for five years. The owners Daniele Fiori and Maurizio Salvadori, entrust its restoration to the naval carpenter Furio Bertoluci. . When the work was just started, the yacht supported by a crane, fell down to the ground due to the rupture of a steel cable. Luckily the damages were mild. For major security the hull was disassembled and reassembled after a careful control. In that occasion all the original bronze keel bolts were replaced. 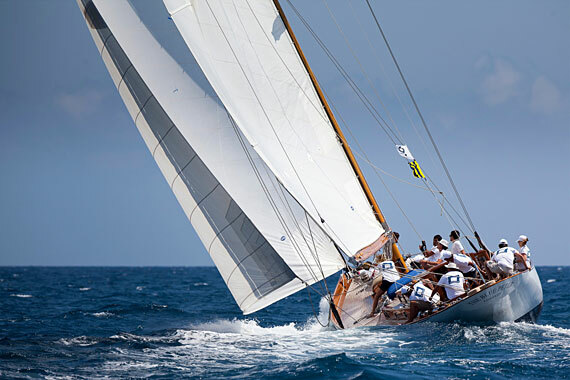 The yacht is living a second youth, participating in Classic Sail Concentrations. Always being elegant and aristocratic, remembering the vast “yachtlovers” public one of the most known Alfred Mylne’s creations.